Photo courtesy of USD and SDSU. 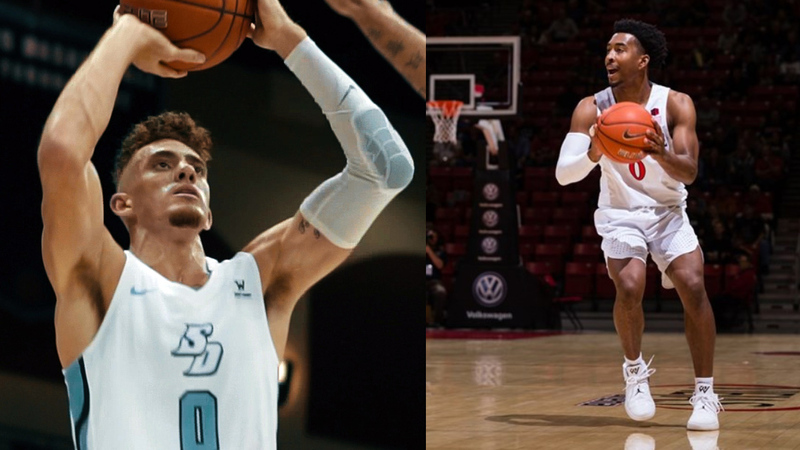 It was a good sports night Tuesday for both San Diego State’s and USD’s men’s basketball teams. They both won their season opener at home. For USD, it was the first win with Sam Scholl, who is making his debut as the Toreros head coach. Down 32-25, the Toreros roared back in the second half to beat Webber State 83-66. It was a tale of two halves for USD, which outscored Webber by 24 points in the second half. The Toreros were 33 percent from the field in the first and 65 percent in the second. USD was led by redshirt senior Isaiah Pineiro, who had a double-double. He scored 25 points and grabbed 12 rebounds. Oline Carter III was the spark for USD’s second-half rally. His 3-pointer started a 13-3 run that was capped by redshirt junior Alex Floresca’s jumper for a 44-39 Toreros lead, which they never relinquished. USD led by as much as 18 points at one point. Isaiah Wright and Carter each scored 13 points. Wright also added eight assists. Yauhen Massalski has eight points and 10 rebounds. Scholl took over the program officially on Easter Sunday after being named the acting head coach for the Toreros final four games following the resignation of Lamont Smith. For the San Diego State Aztecs, 3-pointers were the key to their 76-60 win over Arkansas-Pine Bluff on Tuesday night. SDSU, led by Devin Watson, was 43 percent in field goals. The Aztecs made 12-of-27 of their 3-pointers, including 8 of 15 in the second half. Watson made a career-high six treys and scored a total of 20 points for SDSU. Jalen McDaniels had 15, Jeremy Hemsley scored 14 and Matt Mitchell with 10 — all three are returning starters. The Aztecs answered back with a 9-0 and a 12-0 run that gave SDSU as comfortable 23-point lead with less than five minutes remaining. McDaniels, Hemsley and Mitchell all scored at least one 3-pointers in the game. After Watson, McDaniels was the second highest scorer for the Aztecs with 15 points, Hemsley had 14 and Mitchell 10. Up next, The Aztecs play host to Texas Southern at 7 p.m. Friday at Viejas Center then they head to Maui for the Jim Maui invitation.